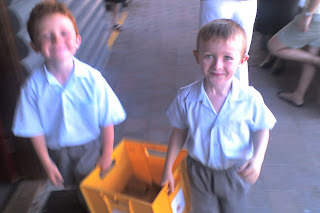 School photos were taken last term and arrived home in school bags this week. With the arrival of the new computer our old scanner is very put out and is refusing to make friends. I have resorted to taking photos of photos to blog them! So here is the obligatory blue background three in a pose shot of my three monkeys. They look very respectable. Give me outdoor, running around, wind in the hair pictures any day! I was transferring images from my phone last week and came across a couple of photos I took of Gareth in school last term. He had been sent on an errand with his friend Tom and I was able to take a quick photo of them on my mobile as they passed. They looked very cheeky and I cant resist blogging them! 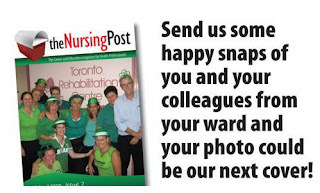 Not satisfied with being on the front cover of the Nursing Post magazine in March, my boss Jane put forward another photo of our team for the front cover of the April edition! I wonder what photo shoots Jane has planned for the May edition! Can you see any similarity between this girl.....? This wonderful birthday card came from Granny + Grandad Joe in Dublin. They thought it looked very similar to a certain birthday girl. Today was Rhiannon's actual birthday. It was busy at the breakfast table with her four friends who had stayed the night before. Byron was busy flipping pancakes furiously trying to keep up with their appetites. When the madness of breakfast was finished the girls packed their bags and were picked up one by one by their rested looking parents who had no doubt had their full 8 hours of sleep the night before. When we were finally back to being just us we put the kettle on and sat back to look at our trashed house so we could decide where to start with the tidy up before the next part of the day, the family BBQ! We deflated beds, put linen in the washing machine, vacuumed, mopped, filled the dishwasher, collected scraps of wrapping paper and abandoned envelopes and emptied the bins. We sliced potatoes, prepared meat, made brown bread (for Joe), emptied the dishwasher, set the table, poured wine to breathe, put bubbles in the freezer to chill, iced another cake (half for Rhiannon, half for Joe), wrapped gifts (for Joe), Why Joe? My brother Joe will be away for his birthday next month so we were going to celebrate his today too! Another cup of tea and then in poured Joe, Rhonda, Cian, Anne, Kel and a little later Tenelle. The next few hours were a flurry of laughter, cooking, eating, kids playing, opening presents, singing double Happy Birthday, and endless topping up of glasses until night fell, kids wilted, plates were empty, candles dimmed and we waved goodbye to everyone under the light of the front porch. We spent ten minutes blitzing the kitchen, throwing things into the dishwasher, cleaning down surfaces and pouring the last of the wine into our glasses before all five of us cuddled up on the sofa to watch Rhiannon's choice: Dr Who. A perfect end to a perfect day! 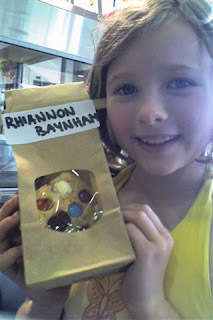 Rhiannon asked could she have a sleepover for her birthday this year. It is always hard when she has lots of lovely friends she plays with in school to choose only a small handful to celebrate with. She named four friends which seemed pretty reasonable for Rhiannon. We decided to have the sleepover this weekend as her actual birthday was on Sunday. She helped me to make a cake and iced it and then she got some of her treasured "Littlest Pet Shop" characters to stick on top. We had bought some special candles that glowed with different coloured flames. Simple and easy! After mass on Saturday night we had tea with her friends, birthday cake, sparklers and then into pj's and sleeping bags upstairs where they told stories and whispered and giggled until midnight. The giggles started again about 6am so not a lot of sleep but at least a good time was had by all. Each year St Joseph's school are invited to march in the ANZAC day parade in our local main street. 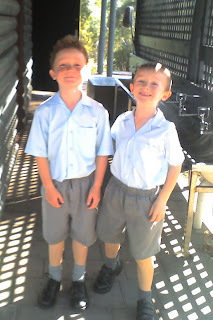 Each year since we arrived here in Australia we have brought our kids to this parade dressed in full school uniform so that they can be a part of it. 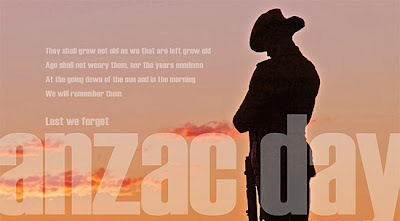 Until this ANZAC day we weren't Australian citizens, we didn't have family members in the Australian armed forces, we weren't marching to commemorate a particular person. But still we marched. We chose to move to this country, a country with so much to offer our family, the chance of a great future for our kids, the freedom to live a happy life in safe surroundings. So many people fought hard for this freedom that we are benefitting from. We owe it them to march side by side with our Australian friends. Especially when this year we march as Australian Citizens. 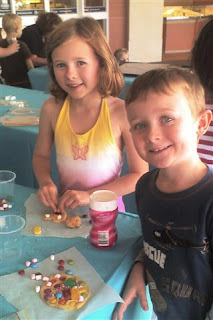 The nice ladies at Muffin Break were running a free "decorate your own cookie" stall today at our local shopping center. Gareth was very suspicious of the friendly, smiley ladies with their tables set out with sheets of baking paper and sprinkles. Rhiannon was happily queuing but Gar said he didn't want to do it. I told him if he queued I would make his cookie for him. He agreed very reluctantly and with suspicion written all over his face. Funny how that suspicion melted away when he was given his bag of cookie dough and a small cup of smarties, gummi bears and mini marshmallows. No way was he sharing with his mum now! They made their cookies. 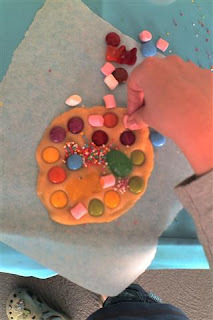 Stuck as many sweets into the dough as possible and then ate the leftovers. The ladies took their baking sheets away with their names written on them and told us to come back in half and hour when they would be finished baking. When we went back the cookies were in little brown paper bags with see through windows where the mad colourful cookies could be seen fighting their way out. The cookies didn't last long. They were out of the bags and scoffed in record time by a grinning Rhiannon and a no longer "suspicious? who me?" Gar. My back tyre has been slowly deflating. Every day this week before I drove somewhere I had to pull into the local garage and use the air compressor to refill the tyre. I thought that I was in for a bill of a couple of hundred dollars for a new tyre and was trying to put off the inevitable. Finally this morning we drove to the local tyre shop and held our breath. Deservedly so! Look what they pulled out of the tyre! What was the damage financially? $18.50 to plug the hole! I am about to share with you a recipe for the nicest, easiest chocolate cake in the whole world. I call it 6 minute microwave chocolate cake. All you do is throw all the ingredients into a bowl, beat them for about 3 minutes, pour into the tin of your choice and then either throw in the oven for 20 minutes or the microwave for 6 minutes! There is an optional icing which can be made in a saucepan while the microwave is humming in the background. Pour the icing straight over the hot cake as soon as it is cooked and it will soak in making a sticky fudge-like cake that is to die for. You can even kid yourself that the cake is healthy because it is made with wholemeal flour. Guilt free! To make the cake easy to share and more fun for the kids why not pour the mixture into cup cakes or muffin trays. I have some great muffin trays in star shapes which the kids love. They are made by Wiltshire and are flexible silicone, practically indestructible and easy to pop the cakes out of. This special pink ribbon star shaped tray was also supporting breast cancer research so everyone is a winner. We bought ours at a local Kmart but I am sure they will be available in other big stores too. We were going to a friends house for dinner last night and made some chocolate star cakes with Anne's left over birthday cake mixture from earlier that morning. Obviously we didn't tell Jo this when we presented them to her, oh no, we let her believe we had slaved for hours making them! I hope you enjoy this recipe. Let me know how you get on. It was Anne's Birthday earlier this week. She arranged to call in to have breakfast with us this morning to celebrate. We had a big pile of pancakes with a mixture of Maple Syrup, Nutella, lemon juice and sugar. Straight after filling up on the pancakes we took a cake out of the oven, covered it in chocolate icing, sprinkles, a cocktail umbrella and a candle. We sang her Happy Birthday before tucking in. We were stuffed and it was only 10 in the morning. The kids had great fun and hopefully Anne did too! We had a brilliant day today. We went on an "adventure" with Maree. 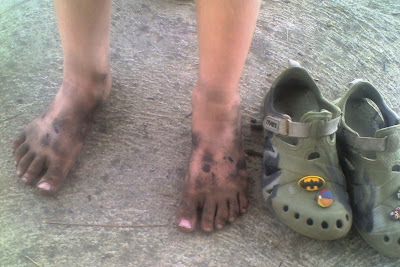 If you have read the previous post you will see what Gareth looked like at the end of the day. You've seen the picture now I'll try to tell the rest of the story, hopefully in less than 1000 words! All we knew is that we were going bushwalking and needed to come prepared with water bottles, sunscreen, mozzie repellent and sturdy shoes. We met up at 10am and drove in convoy behind Marees car until we got to a place called Valentine. Then we started a 2km walk through grass, gum trees, over small streams (creeks here in Australia!) until we found ourselves at a beautiful lookout point with a picnic table under shade next to a long jetty. Some of the boys had brought their fishing rods. 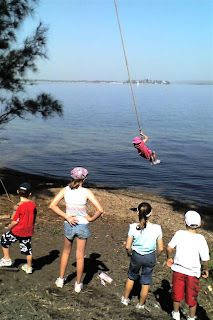 The next few hours was bliss as the kids fished, swung on a rope out over the water, swam and shared picnic food. The bushwalk home nearly killed me! It was 5pm as we returned to the car hot, sweaty and covered in dust. Another day of the Easter School Holidays spent having a great time and without breaking the bank. Success! How do I know we had a great day today? 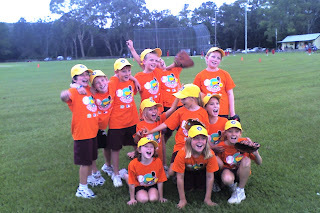 Last week marked the end of the 2009 T Ball season. Sian, Rhiannon and Gareth were all in different St Josephs teams playing other local schools. It was a bit crazy running between three areas of the huge baseball fields to cheer each kid on at different times each Thursday night. Gareths team just played for fun with not much emphasis on scores. Rhiannons team tried hard, as hard as a bunch of giggly 8 and 9 year olds can play. They made it to the final but lost on the night to the other team the "All Stars"
The baseball association put on a free sausage BBQ after presenting all the kids with medals and certificates. It was a great season. Cheap outdoor fun with friends. Thanks a million to the Australian Baseball coaches for volunteering their time to coach our kids. You have given them 6 great weeks of fun and memories. We went for a walk today with our friends the Scanlons. As always it was a chilled out, fun afternoon. Poor Sophie has been through her fair share of drama over the last two weeks with an accident severing some tendons in her wrist, micro surgery and now a splint for the next few weeks while it heals. It is not supposed to get wet so our hearts were in our mouths as she picked shells out of the waters edge with the other kids. It was hard to say stop to her when she was made to sit on the grass while the others climbed trees earlier. We ended the day with a play in the playground before heading back to the car. After a bit of whispering between the kids it was decided that we were going to do a bit of child swapping. I took Gareth, Sian and Gemma home to our house for the night leaving Sophie and Rhiannon with Monica. It looks like I got the easy end of the deal with the older more sensible girls but I better not laugh too soon as something tells me I will probably end up with the two mad giggling younger girls later on in the holidays. Watch this space! We've been in our new house for two years now. Something small that has been bugging me was the wasted tall cupboard in my laundry room. It is a great tall cupboard but had only one shelf so all the potential things to be stored in it were piled up on the bottom spilling out on me every time I opened the door. I rang and got a quote from a local company to put extra shelving in. They quoted 4 weeks and $200 to do the job! If you know me you will know that I am impatient and once I decided I wanted shelves I wasn't going to wait 4 weeks for them. As for paying $200... No chance! Off I went to our local Bunnings DIY shop and bought a $20 piece of white melamine coated MDF. The nice man in the woodwork section fell under the spell of my fluttering eyelashes and agreed to cut it down to size for me on their industrial wall mounted saw. I walked away 10 minutes later with four perfect pieces of melamine just begging to be given a new home in my laundry. Today out came the drill, hammer and spirit level and I am now totally in love with my newly organised cupboard. All for the bargain price of $5 a shelf. I really need to get a life! What can you do over and over that is free and makes your heart happy as an eight year old..? Rolling down a grassy hill! What is the final icing on the cake? Getting to the bottom and finding a tiny bubble resting on a blade of grass!